One of the major issues with the way most people eat these days is the sheer amount of additives and chemicals they’re exposed to from simply eating a ‘normal’ diet high in convenience and packaged products. Many of us assume that the products we buy at supermarkets are safe, and we continue to buy them unaware of what’s really in them. I loved talking with Tanya Winfield from Additive Free Pantry for this interview and feature – her level of commitment and passion for sharing the information is inspirational in many ways. Not only has she helped thousands of women take small but significant steps towards a healthier diet through eliminating additives, she’s also an incredibly inspiring business woman who shows us what is possible when a mum chooses to follow her passion. You can also listen in to a podcast interview with Tanya where she goes into more detail about how her business came about. Click here and look for episode SHE 010. Watching a story on Oprah one day about a woman who made a six-figure income from baking cupcakes, Tanya Winfield’s eyes were first opened to the possibility of being able to work for herself doing something she loved. She had no idea what that something would be – what she was passionate about – but she knew that although she could bake cupcakes, she didn’t want to bake them for the next 20 years. It was during a visit to a friend’s place with her young children in tow that she would accidentally find her ‘thing’ – the something she would be passionate about and that would change not only her life but also the lives of her children and thousands of Australian families, for the better. 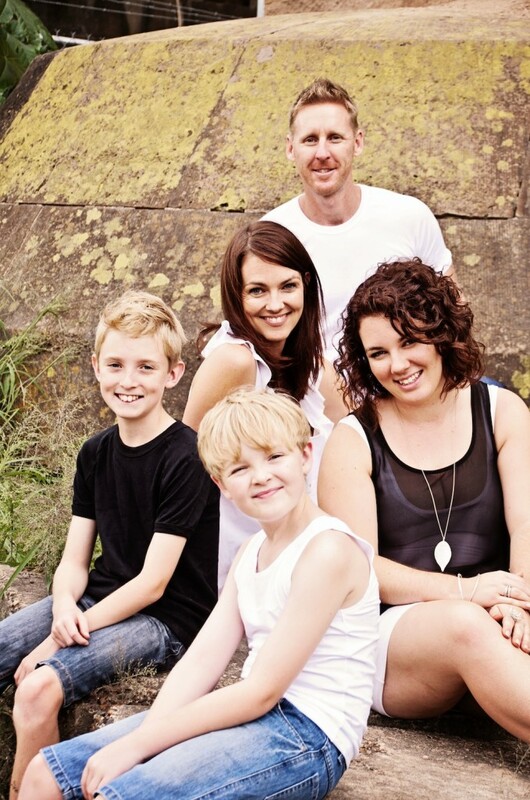 “I knew there was something more than just being a mum. I didn’t have any idea what exactly. Tanya Winfield and her family. 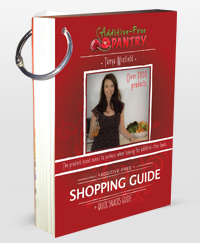 The ‘additive thing’ Tanya speaks of is in fact Additive Free Pantry, her website, business and series of guides and books to help people understand the impact of and how to remove harmful additives. Her journey to additive-free living started when her middle child, son Kade, was diagnosed with asthma when he was around two-and-half. “He was wheezing one night and I thought he had a bit of a cold,” Tanya said. Told she had no option but to give her son medications every day, Tanya instead went to a naturopath and started looking for alternatives. “I didn’t look at or think about food though,” she said. “It wasn’t until I was at a friend’s house one day and the kids had eaten all this food. My friend mentioned a book about additives. “I read what was in the biscuits the kids had just eaten, and then looked up the numbers, and saw that number 320 (a synthetic antioxidant used as a preservative – read about it here and here) was bad for asthmatics. “Kade was on to his fourth biscuit when I read 319 was linked as well, and I became more astounded,” Tanya said. “I borrowed the book and went home and just cleared my pantry out. I didn’t know exactly what everything was, but if it had the numbers, I took it out. “I just decided if it was bad for Kade, I didn’t want anyone to have it. It just wouldn’t be in the house. It would be the beginning of the Additive Free Pantry, which started from humble beginnings on her lounge room floor and now has tens of thousands of followers. “I happened to be at an Enjo demonstration and the idea of additive-free parties came along. “I would go into people’s homes and take a supply of books I had learned from, and talk about what I had learned. She moved on to pantry audits and showing women alternative products to the ones they were using. Next up came a shopping guide, which Tanya made and printed at home. It had a little red cover and was laminated and hole punched, with Tanya making them up on her lounge room floor at night. That little guide has since been published professionally and is currently in its fourth edition, having gone from featuring 300 products to now listing 1300. “It just evolved. I didn’t have a website for 18 months. No products or shopping cart. “I just wanted to tell people the information. “When I started out, I wanted to help 10 or 20 people. I never thought I’d have the followers I do or the interest or support I do. “As for Kade, he still has to be considered an asthmatic at school because that’s how he has been diagnosed, but he hasn’t had a puffer for almost three years, he hasn’t been on a nebuliser since being additive free. Tanya’s success is testament not only to her passion and enthusiasm for sharing her message but also to the situation facing so many mums when it comes to food now – flooded with convenience and packaged foods and not understanding the full impact of the ingredients they contain. She said she once assumed ‘someone’ was looking out for consumers’ best interests when it came to food safety and health, and knows other people make the same assumptions when it comes to what they buy. “I’ll think to myself, this is really basic, but I was that mum once as well – the one who didn’t know any better. “I was eating and buying the foods that were marketed well. I thought I was healthy but my kids were eating Cheerios with apple juice and Vegemite on toast. “Additives touch every aspect of food. It’s not just in a snack. It’s in every meal you can possibly have, across the board, in mainstream types of food. “They’re in medicines and vaccines and things that go on your skin. They’re everywhere and I don’t think people realise how often or how much they’re having. “I didn’t go back because I can see the difference in my children. “I think: how come so many people are having issues with OCD, ADHD or autism? How come it’s growing and not depleting? Tanya says whilst additive-free eating isn’t the cure-all for healthy eating, it is a start. “Additive-free still allows you to overload on sugar and other rubbish – it’s not about whole foods or organic. “It’s about making a start and doing something. “If women just realise they can do a little bit at a time, just start with breakfast or lunchboxes and slowly improve, they can see it isn’t so hard. “I think there’s so much pressure for women to get it right all the time, so they get overwhelmed and then do nothing. Is it time to start eating better – for both you and your family? As a health coach and busy working mum, I created The Better Mums Project – a simple to follow, four-step program to help women just like me change their diet for the better.